A weekly newspaper has become the latest to unveil a new-look website under a roll-out of a new design across Trinity Mirror regional titles. 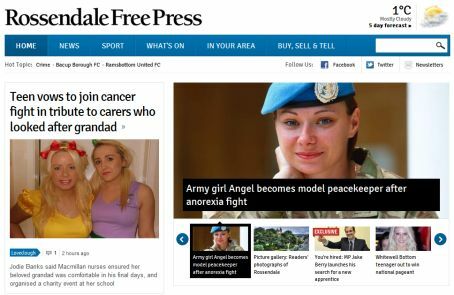 The Rossendale Free Press launched its revamped website on Wednesday with a simplified structure which aims to be easier for users to navigate. Along with other recently relaunched Trinity Mirror websites, it only allows people to post comments if they have a Facebook log-in. Other papers in the group to have launched new websites include the Manchester Evening News, Birmingham Mail, Newcastle Evening Chronicle and the Accrington Observer. An article about the new website said it would feature new picture galleries, easier navigation, more topic pages and a refreshed mobile site and it aimed to be “more enjoyable, informative and up to date”. There is also a new In Your Area section of the site where people can find out about news from their local community on a dedicated page.